Description: Westbound G909 is lensed from the US 340 Bridge as it rolls through Sandy Hook, MD with GP40-2 6355 leading five more 4-axle units on the head end. Kodachrome by C. Hash. Description: CSX 8777 & 6355 lead an intermodal train southbound at Petersburg, Va. Title: CSX K277 Splitting the Diamond! Description: Wow, the builders plat is still on this one...but for how long.. Description: The locals two engines clear the knauf switch so they can pick up the cars recently dropped off by the Trackmobile. Description: The locals engines wait as the train crew goes to lunch at the local fried chicken joint down the street. 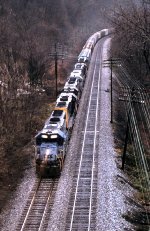 Title: NB CSX 6355 passes by Fort Branch, In.. Description: Notice how close the back of that semi is to the tracks. Description: 6355 switching safety klean. Description: CSX 6355 pulls this evening's D738 south to Wayne. Description: Q202 with lead engine 8352 and 6355 pulls a auto-rack along Gaither Station Road on a road being constucted. Description: CSX Local rests in Bessemer AL CSXT Yard on the mineral Sub waiting for a crew to finish the next job. Description: CSXT Southbound Local Freight Train A735 ( Birmingham to Talladega, Al. Turn ) passing through Oxmoor, Al. on their way to interchange with EARY in Talladega, Al.